THE functional new look of athletic tops. Snug fit & superior support for surf & swim, running, volleyball, cross-training, etc. Four-way stretch European fabric / Ultra soft lingerie lining. 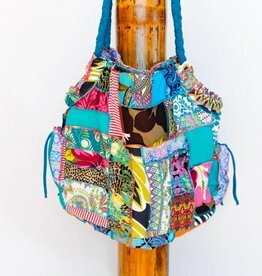 • Hand made one-of-a-kind from a patchwork of your favorite Pualani prints! • Gusseted bottom maximizes storage capacity. • #1 Selling Surf Bottom - Super secure for all activities! • Four-way stretch European fabric. • Ultra soft lingerie lining. • Wide bands & a full front panel provide a slimming effect - excellent for surfing. • Four-way stretch European fabric. • Ultra soft lingerie lining.